To function, WooCommerce requires the creation of a few pages, as well as other information required to run a store. This is done using the Setup Wizard, run automatically when the plugin is activated. If the Setup Wizard is not activated, or you’ve activated it previously and skipped it, look in the Reactivating the Setup Wizard section for information on how to launch it again. The first step of the Setup Wizard displays information about the plugin. Click Let’s Go to continue. 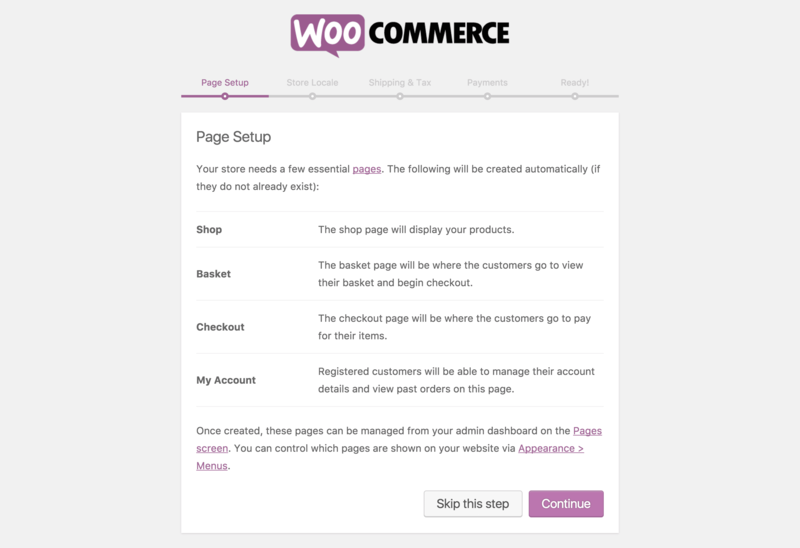 The next step creates the four pages required for WooCommerce to function – Shop, Basket, Checkout, and My Account. If pages with these titles already exist, they will be used. 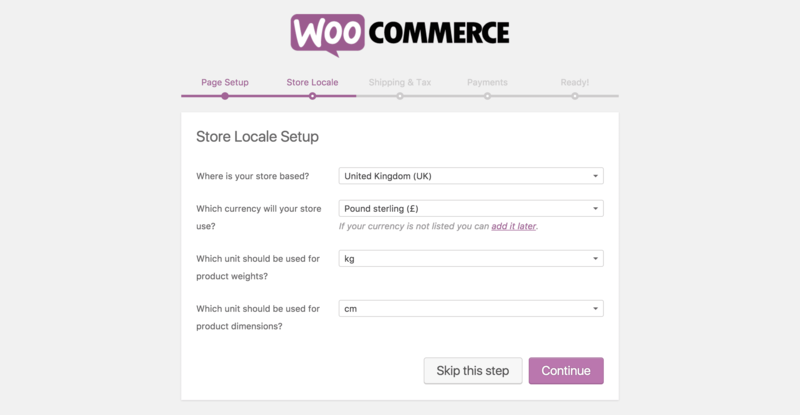 These pages can later be changed in WooCommerce settings. Click Continue to create the pages. PayPal Standard: A simple PayPal implementation which forwards your buyers to the PayPal site to pay. Doesn’t require you to comply with any payment security laws as everything is handled by PayPal. Automatically sends buyer data to PayPal and marks orders as paid. The last step signifies that you’ve successfully setup your store! Select any of the options on the page to create a new product, learn more about WooCommerce or Return to the WordPress Dashboard. 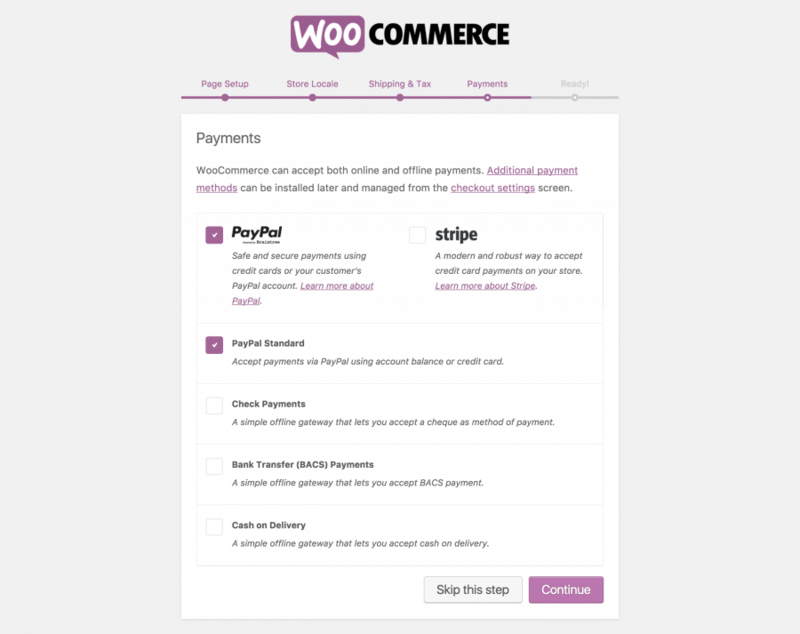 Congratulations, you’ve set up your WooCommerce store! Your store pages are now available as standard WordPress pages, so you can add them to your menus and link to them from other pages. Don’t forget to check out WooCommerce → Settings to further customize your store, and set-up payment methods in WooCommerce → Settings → Checkout so you can actually take payments.